This article demonstates how the setup a file upload using Web API and save it to a MS SQL Server database using a FileTable. Because a FileTable is used, the files can be saved directly to the database, without creating an extra stream. The files can be then accessed using the database or directly in the file system. To setup,, a new database is created which has Filestreams enabled. This feature only works with windows authentication. Firstly if not already configured, the Filestream access level is set to 2. 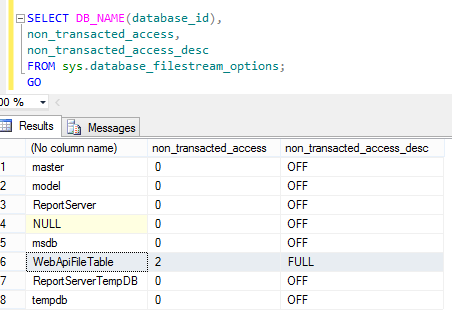 Adding a Entity framework code first data access layer. Now a file description table is created for searching and returning multiple records. This is used to setup a download link and provide a small description of the file. To create the table, Entity framework code first is used in this example. Download Entity Framework version 6 or later. Then create a Context for Entity framework. Create a model class for the table. Now the string connection needs to be added to the config file. The name name must match the Context Name, otherwise the this must be manually mapped. Now a simple repository is created for the file description access. 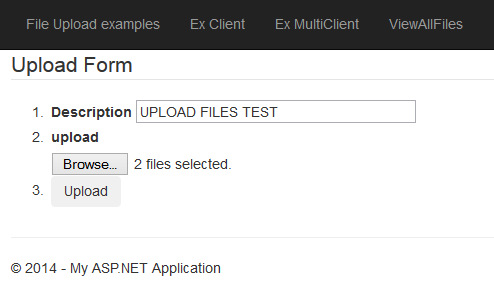 Web API file upload/download with FileTable persistence. A Web API controller method is created for the file upload. This method uses an action filter to validate the MIME type, saves the file to the database using a MultipartFormDataStreamProvider instance, creates the file description objects, saves them to the database and returns these to the UI. This method will only work if the client sends a valid content. For this the name must be defined on the multiple input html control. Once the files have been upload a view all files action method can be used to select the file descriptions from the database. The file descriptions are parsed into html using razor. Each file link can then be clicked. The link requests the download link in the Web API controller and the file is downloaded. I’m facing these errors you’re talking about, can you help me please what change you have made to get it working, Please help me..
Hi Eduard, thanks, I’ll clean up the text a bit. The FileDescriptions table is created by EntityFramework when the application starts. The rest was created directly by running the sql scripts. Maybe I should create the whole database using the SQL scripts and not use the migrations. great article, can you please show how you have your media type formatter setup? How is FileDescriptions table linked to WebApiUploads or WebApiUploads_Dir?